The softest, lemon-packed cake on the face of the earth. If you are a lemon lover, this will be your new favorite! Oh you guys, this lemon bundt cake is SO good. I have seriously become addicted to lemon desserts. I even got Mike addicted too. I don’t know where it came from?! There’s something about the tart and sweet combination that is just so amazing. This cake is no exception. If you are looking for a light and fluffy cake, this probably isn’t the cake for you. 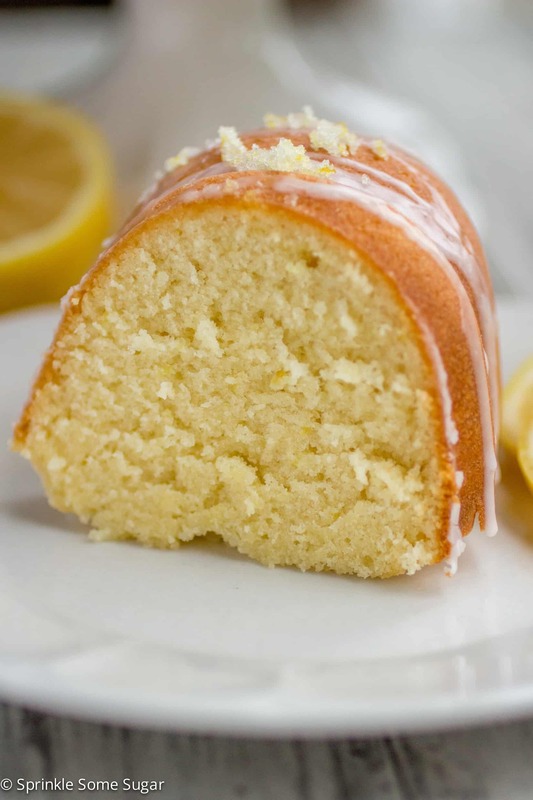 It is sort of dense – think: pound cake – but it is so ridiculously soft, moist and packed with lemony flavor. The lemon glaze on top really brings this dessert over the top and really packs a big punch of lemony flavor. The cakes delicious on it’s own but the glaze is totally and completely necessary! 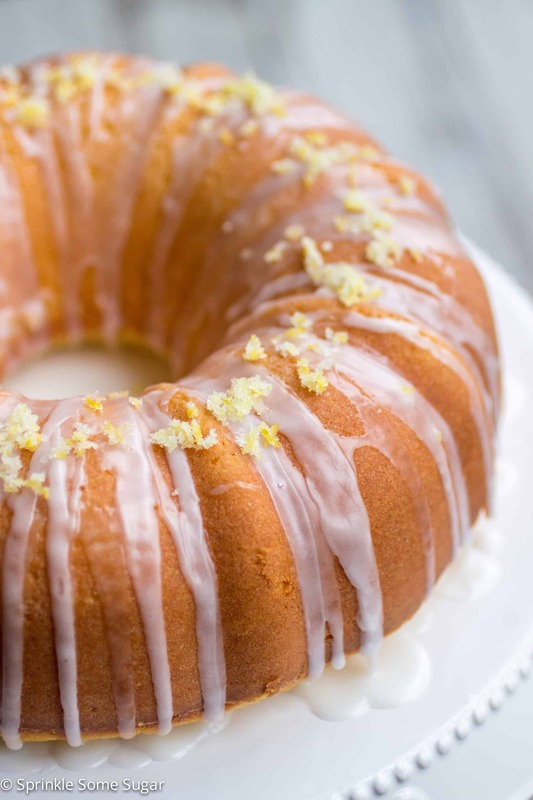 The lemon sugar sprinkled on top makes it look even prettier while adding to the lemon flavor. This cake is for true lemon lovers! The cake is so simple to put together and uses such common ingredients. I love making bundt cakes because they’re so pretty with such minimal effort! Be sure to grease your pan extreeeemely well so the cake slips right out. If a few spots get stuck on, don’t even worry about it because you can cover it with the glaze. On top there’s lemon sugar sprinkled on. I’ve never made lemon sugar until this recipe and it’s so yummy! Leaving the lemon zest in with the sugar is totally optional, but sometimes I push the sugar through a fine mesh strainer to separate the two, depending who I am serving. It’s all about personal preference. If you love lemon, you absolutely need to make this.. like now. Lightly whisk flour, baking powder and salt in a small bowl and set aside. In the bowl of your stand mixer (if you're using one) fitted with the paddle attachment, beat eggs on low until they are thickened and very pale yellow in color. Turn mixer on low and slowly add sugar to running mixer and beat on medium-high speed until light and fluffy. Stir in vanilla, lemon juice and lemon zest. Slowly pour in dry ingredients on low speed until combined. In a small saucepan, heat milk until very hot and butter is just melted. Do not boil and whisk the mixture to help the butter along. Pour into batter and mix until smooth. Batter will be very thin. Pour into prepared baking pan and bake for 27-35 minutes or until a toothpick inserted into the center comes out with a few moist crumbs. Once done, remove cake from oven and allow to cool for 5 minutes in pan. Release the sides of the cake with a butter knife to ensure it isn’t going to stick. Turn cake onto a large round platter or cake stand. (If using a 9x13 pan, do not remove cake, just place entire pan onto wire rack so underneath the pan can cool also.) Allow cake to finish cooling until warm to the touch. Adapted from Amy Kay’s Kitchen originally adapted from Taste of Home. 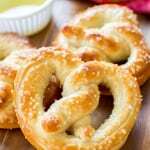 « Top Recipes For 2016! Jessica, This is a beautiful looking cake and, lemon…. I LOVE IT!!!! Thanks for sharing this recipe!! Thanks so much Angela! It’s one of my favorites! I don’t see why not! The result would probably be delicious! If you go ahead and try, let me know how it is! I have tried it with the orange zest/juice & it was delicious! Thank u! Thanks so much for reporting back, that’s great to know! I’m going to have to try that soon for my orange loving guy! I LOVED THIS CAKE, EVRYONE ELSW LOVED IT. DIDNT HAVE TO CHANGE A THING ABOUT IT, AND TRYING ORANGE THE NEXT TIME, YOU DID AN. AWESOME JOB. TY SO MUCH. Orange sounds delicious! Thanks so much Tandrea, I really appreciate it! Now I want to try Grapefruit! Lemon was delicious. Thank you! That’s awesome to hear! Thanks for letting me know! I am going to make the Lemon pound cake in just a bit. You don’t say in the recioe to sift flour. Just making sure I don’t have to sift. Nope, no need to sift! This looks AMAZING and I’m baking it tomorrow!!! I’d love to make this for a dinner party for 14 guests … Can I do it in a regular cake pan? My bundt pan is currently broken in half and I don’t have time to get a new one in time for the party! No, you cannot. Cake mix cannot substitute flour. Was all set to make this delicious looking cake . Thought it was meant to be baked in a bundt pan. Correct ? You can make it in a cake pan, it will taste good but the density will be different. The shape of the bundt allows for a slower evaporation which really helps build that beloved density. A cake pan’s cook time and temp will need some adjustment. Can I use almond or soy milk instead of whole milk? 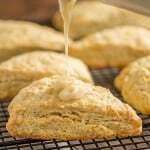 I have never tested either in this recipe but I bake with almond milk often with great results! I think that will be your best option. Hope this helps! Be sure to report back if you try it! I can’t wait to try baking this right now! I hope you loved it, Diana! First time I made this turned out fantastic, moist a big hit. If you like lemon this is the cake,the only one you will need. I’m so happy you loved it, Joy! It’s definitely one of my favorites! 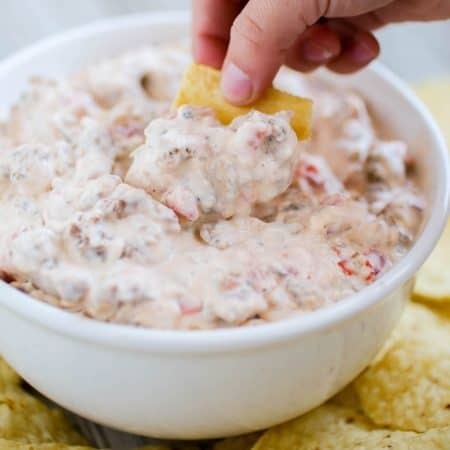 Made this and it is delicious… Easy and the ingredients are things that are around already. Thanks for sharing this. Made this cake today and was really good. Have not made a cake with this method of heating the milk and butter, but it worked. VERY favorable also. I will be making this cake again. Yay! Thanks for letting me know, Terrie! I just made this and my family loves it! 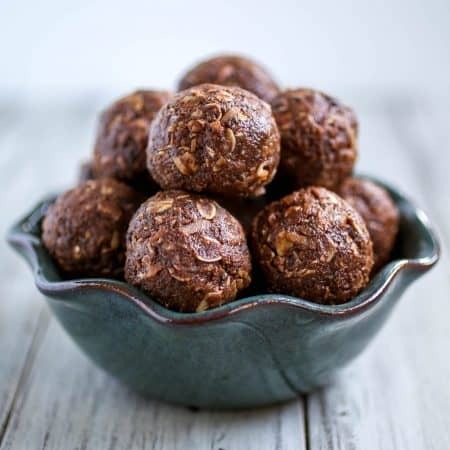 Super easy and very delicious! I’ll definitely make this again. Thanks for the great recipe! I just made this cake and was so skeptical about heating the milk and butter. I’ve been baking for a long time and never made a cake this way. I almost didn’t do it, but I couldn’t figure out how to incorporate the milk and butter. So I just bit the bullet and heated the milk, melted the butter and hoped for the best. The cake turned out amazing, it looks just like your picture. This recipe is definitely a keeper. Thank you so much for sharing it. Did you add the hot milk mix to the flour mixture or did you let it cool a while before adding it? because it was tooooooooo lemony for me…others might like it too..thanks it was great. This seems like a terrible amount of sugar to me, has anyone tried it with less? I agree, looking at it it does seem like a lot. I have not tried it with less but I imagine you may be able to get away with a lesser amount, it just may be a little more tart. May I ask what bundt pan you used? Brand name? Size (cups)? I bought a new heavier bundt pan but it seems to make the cakes turn out really brown. Thank you. I can’t wait to try this recipe. I love lemon desserts. Has anyone made cupcakes with this batter? Not that I know of. If you try it out, let me know how it comes out! This bundt cake has a very soft, velvety, almost poundcake-like texture so I’m not sure this would be a great recipe for cupcakes. But I could be wrong! Hi! Did you (or anyone else) ever try baking cupcakes with the recipe? No I have not tried myself nor have heard of anyone else trying this recipe as cupcakes. I’m not sure this cake is the right texture for cupcakes, it has a soft/dense pound cake-like texture. But I may be wrong, they could come out wonderful! That’s so great to hear that they turn out awesome as cupcakes! I’ve been wanting to test that but haven’t gotten around to it, so thank you! Has anyone used batter for cupcakes? I’ve tried it as cupcakes, it was some time ago but if i remember correctly i baked at 180celcius for about 15minutes. 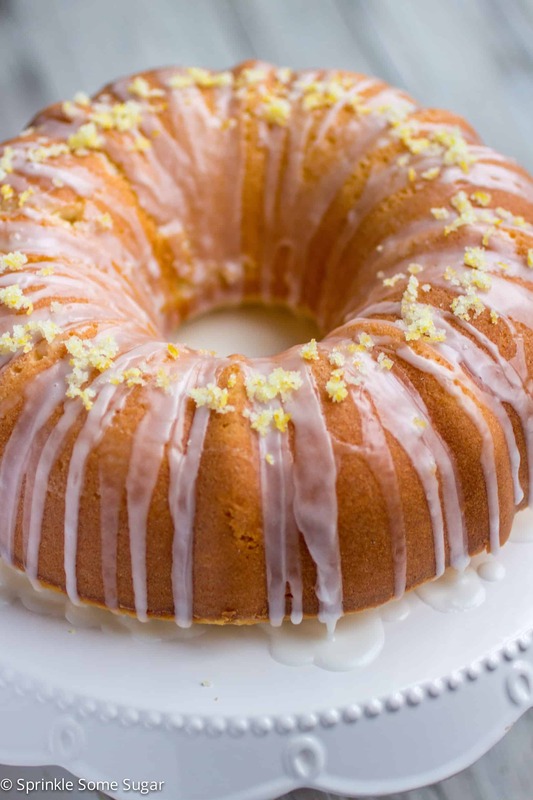 Could you please send me the lemon bundt cake recipe? 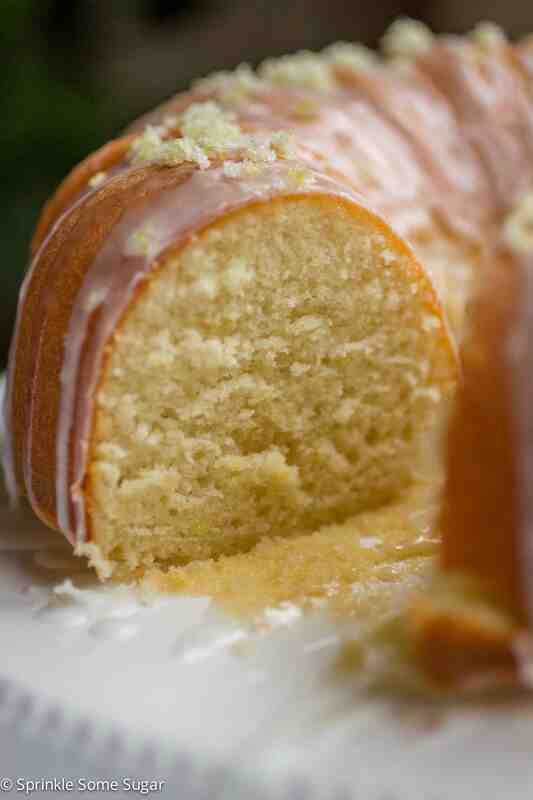 I make a lemon sour cream pound cake that’s really good but I’d like a variation on it!! This sounds awesome,I love coconut ! Thank you!! awesome recipes will be trying them soon! this was amazing! thank you for sharing. you were right, texture was stellar, lemon flavour was perfect!! i made in two loaf tins and made perfect slices for finger food at a luncheon. i left the lemon zest in the sugar topping – really made it pop in colour and burst in flavour!. thank you for sharing. this recipe will be my go to when we want something different than Mama’s Pound cake by Paula Deen – very similar texture. Yay! I’m so happy you loved this recipe. I’ve never made it into loaves, sounds yummy! this recipe does not work for me but it could be that I did not use whole milk I used nonfat could that have been the problem? r it didn’t raise on part of the cake…..
I’m very sorry this recipe didn’t work out for you! I have never tested this recipe using nonfat milk so I can’t say for sure if that was the definite problem, but being that there is basically no fat content in nonfat milk, there may not have been enough fat to support the cake batter. Either that or it actually sounds like maybe your oven temperature could be off because I would think if the milk was the problem, then the whole entire cake wouldn’t rise, not just one part. I’m sorry I couldn’t be much of help, but you should definitely give this cake another go with whole milk and see if that works out for you because it’s awesome! I’ve made this with low fat milk and it turned out perfect! 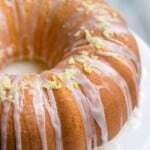 Love love this lemon cake recipe!! I’m making this cake now and it’s been in for the 35 min and it’s still runny. I’ve read over the ingredients and they were correct according to the recipe. Just put on another 8 min. Is this normal. Yes, totally normal. I always think it isn’t going to set up but it does towards the end of the baking time. Did it work out for you? I made this for Easter — so good! Instead of the glaze (because I was out of powdered sugar! ), I beat the lemon sugar into whipped cream. Once the cream was light and airy, I added two big spoonfuls of jarred lemon curd and beat again. 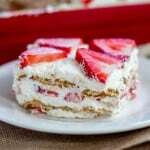 Served the slices of cake with dollops of the lemon whipped cream. Yes ma’am!! This is going into the regular repertoire. Thanks for posting it! I made this for Easter too and your version sounds so awesome!! I might try that next! Thanks, Corinne! I have just bake it and I like it, but next time I’ll add more sugar, also I getconfused by the exactly amount of lemon juice because you day 2+2 tbs. I used 3tbs and it turned out not so lemony but still was ok. 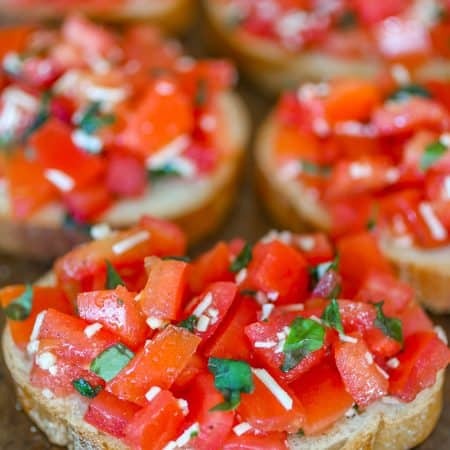 I am so glad I found this recipe, it sounds perfect for Mother’s Day this weekend! Do you know if anyone has ever tried adding blueberries? I was thinking of folding some in just before pouring into the bundt pan. Great recipe — I made some cupcakes with some new silicone molds and they turned out great! So then I bought a silicone pan with a sunflower pattern, put in the entire amount of batter and unfortunately, the center practically oozed out, yet the outside was very done, but not overdone. I gave it another 10 minutes, then another 8 minutes — but still took it out too soon. ;-( I will just make sure when I bake it again, that it stays in longer. Have heard the suggestion of “tenting” to avoid the outside burning, in case this kind of thing happens again and it has to stay in longer. The recipe is delicious. I made this yesterday for Mother’s Day and it was DELICIOUS. I used skim milk instead of whole milk to make it a little leaner, and salted butter instead of unsalted because that’s all I had. I did have to bake it a little longer than the recipe stated too. But it turned out wonderful! Definitely a recipe to remember. Thanks! I loved this cake! Served it at a crawfish boil we had over Mother’s Day w-end. Delicious! The only thing i did differently was beat my eggs on medium high. I didn’t know if the low speed was a typo or not. In my experience to get the eggs to the right consistency you need to incorporate a nice amount of air. Other than that kept the recipe the same! Thanks for a great recipe! Here’s a pic of the finished cake hope it shows up! You’re welcome, Tracy! Your cake looks delicious! I’m also curious to know if you actually meant “beat eggs on low until thickened…” in the instructions. It seems a low speed would be counter-productive to the task of thickening and opposite of instruction in original recipe. That said, there may be some alchemy going on to using a low speed that I’m unaware of. I assume nothing… …that’s why I’m asking. Thanks in advance for any clarification. Yes, I would just omit the salt in the recipe. How many lemons did you have to use to get the zest for both the cake and frosting? I usually use about 2-3, it all depends how big your lemons are. If your lemons are a good size, keep in mind that each one should have about 2-3 tbs lemon juice and 1 tbs of zest. Hope this helps! This cake was fun to make and absolutely delicious. I made it for company. It was a big hit. Now going to make it for two parties that I am invited to. Thank you for sharing this wonderful recipe. Hi Jessica! I can’t tell you how many times I’ve made your lemon loaves. They’re really great and I receive compliments everywhere I bring them! I want to make this bundt cake now but I’d like to know if I could use buttermilk instead of whole milk in this..? I have some leftover in the fridge. Thanks in advance! Yes, that could definitely be why! I hope it came out awesome in the end, Jen! Hi Carmela, I’m sorry your cake came out undercooked, what a bummer! In the recipe instructions I give an approximate time, which is when my cake in my specific oven is usually done. The time it bakes can vary for every oven, since every one is a little different. Which is also why I state to bake until a toothpick inserted into the center comes out with a few moist crumbs. So, next time you bake this cake, be sure to check it with a toothpick to make sure it’s done all the way through! This cake is so delicious, I hope you give it another shot! Mine did too…but im just keeping it in longer until its coked. My was very light on top. Hoping itll turn out great…its for my dads birthday gathering . Thanks for this recipe! I made this Sunday for my grandmother’s 95th birthday, and it was fantastic! I looked through a dozen recipes before I decided to use this one. I did put the glaze on in stages instead of doing it all at once. I put a little on while the cake was still warm so that it would seep into the cracks. When the cake was cool, I added more and let it dry before adding another layer. I did this several times. With the last of the glaze on the cake, I sprinkled on the lemon sugar. So when I was finally able to cut it (it was soooo hard to wait), it had a nice crunch on the outside with the layers of glaze and the sugar. The inside was the perfect density and was moist and lemony and delicious. Thanks for a great recipe. I will definitely make it again! Can’t wait to try this recipe but I don’t have a bundt pan. Has anyone tried using other pans and what were the cake results?? I’ve got a spring form pan, rectangular pan and a loaf pan. Can I use any of those pans? I can’t wait to make thits recipe, sounds fantastic. I don’t have a bundt cake pan though, and I want to make this today. Has anyone tried using other pans for this like a rectangular, springform or loaf pan? Did it work?? 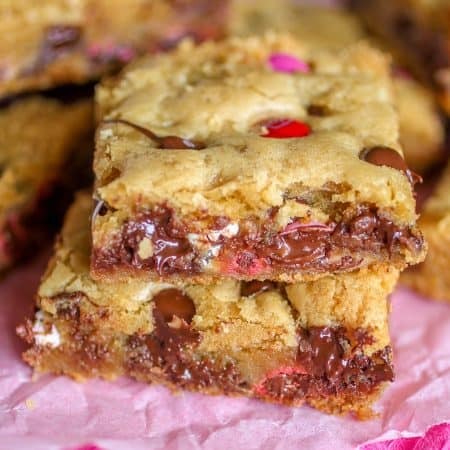 Hi Jenn, you can make this recipe in a 9×13 (rectangular) pan! 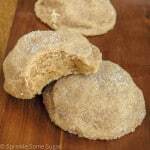 Great recipe- delicious flavor and great texture! I did want to comment that mine took 42 minutes to cook all the way through to reach moist crumb stage. Just FYI for anyone else that’s struggling with the bake-time. Good to know. Thank you, Sarah! I’m glad you enjoyed it! I just made this after finding it on Pinterest. Other than some holiday cookies I am NOT a baker so I was really worried about this but it was great! It did need more time as others stated. I also probably had a little too much lemon in the glaze for me. I did about 4 TBL. I also applied it a little too soon (it sort of melted into the cake) but these are little adjustments and I can’t wait to make it again. I LOVED the lemon sugar too. I grated the zest very fine and left it mixed in with the sugar. Thanks!!! i made this cake and it came out of oven fluffy then within the hour as it was cooling the whole cake fell flat. It was heavy and extremely dense. Any suggestions? This bundt cake does rise up and then as you said, it will come down a bit but it definitely should not have been flat. Hmm. As for the heavy and dense part it should be partially dense because it is sort of like a pound cake-like texture which is naturally dense. I fear you may have over-mixed your batter because that could absolutely cause the cake to be overly dense and heavy. My 10yrs old baked this cake all by herself. The cake very moist and very delicious. She will be making it again for friends soon. Thank you for sharing this wonderful recipe. If you are looking for fluffy, this probably isn’t the cake for you because while it is SUPER soft, it is quite dense. Think of the texture of a really good pound cake, very soft but dense. Hope this helps, Tonya! Hi i made this recipe today for a food party at school but the cake came out dense any idea as to why this might have happened? Hi Diana, this cake isn’t meant to be a fluffy cake, it’s more of pound cake-like texture which is dense but very soft and moist. I hope your party still enjoyed it! It wasnt even like a pound cake though, i dont even kniw how to describe the texture! The milk was probably still too hot when i put it in the batter but i will try this again till i get it right because it still tasted amazing! Hmm, that’s very odd! I’m not sure what happened. That could be possible. If you decide to give it another go, let me know how it turns out! I’m glad it still tasted great, though! I made this cake yesterday for my husband. It is amazing! I added 3Tbsp of poppy seeds and was worried they would all sink or float because of how runny the batter was. They stayed distributed evenly! My oven needed an extra 15 minutes or so as many others have commented. I will be making this again! That sounds like a great addition! Good to know that they don’t sink! Hi there! I am making this cake for my future sister in laws’s bridal shower, but I need to make it the day before as her shower is in the morning. Should I wait to put the glaze on the day of, or do it when it is warm? Also, how do you appropriately “grease” your pan? Butter or spray? Do you flour the pan? Im new at this, so thank you for your guidance! I would glaze it the same day you are making it (the day before) because the cake needs to be a little warm when it gets drizzled on so it will seep into the cake slightly. I take a piece of softened butter and just grease the heck out of the pan, getting every single crevice so I am positive it won’t stick and no need to flour the pan if you grease it very well. I have also used a baking spray with success, the one I used had flour in it so I’m not sure if that makes a difference. I hope this helps and if you have any other questions, fire away! I hope everyone enjoys the cake at the bridal shower. I’ve made this twice now…and WOW. YUM! I got so many compliments I needed this to be dairy free, so I used coconut milk, and it worked perfectly. Help, how much is a Cup ? That’s so amazing, Amir!! You made my day. Thank you, I’m so happy everyone loved it! Made this for our Easter Sunday Festivities. It was a big hit. Delicious!!!! Needless to say it was gone before night fall! Thanks for the recipe. Love this! I’m so happy this recipe was enjoyed by all on such an important day! Made this tonight as I wanted a lemon cake – followed recipe exactly with a little longer baking time….wow! 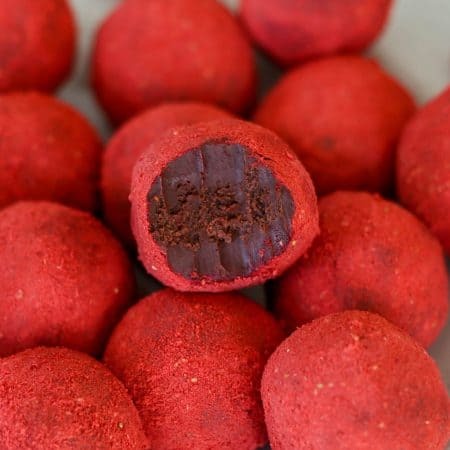 Amazing flavor – will be making again for sure! Great recipe. can i use vegetable oil instead of butter? I have not tested the recipe using vegetable oil so I cannot say for sure, but I don’t see why not! If you try it out, please let me know how it comes out for you. Hi. I just wanted to post a comment to say how amazing this cake is. At first I was sceptical because the recipe was so different to any other cake recipe I’ve ever made, but my word, the result was amazing. I used a bundt pan and my cake took 35 mins to bake and it was perfect. The cake is dense and moist and my hubby can’t walk past the cake stand without cutting a piece. That’s what I call a success. I’ll definitely be making this one again. Thanks for a wonderful recipe. Thanks so much for this recipe!!! Everyone absolutely loves it and it turns out perfect each time. You’re very welcome, Terry! So glad you love this cake as much as we do. This was AMAZING. Made it with Pamlea’s Artisan Flour and it turned out perfect. I made this today and it is fabulous. I love how tangy it is. I am definitely keeping this recipe. Thank you for sharing it with us. I made this cake for a party and converted it to a dairy free option. Used almond milk and coconut oil instead of the whole milk and butter. It turned out great! 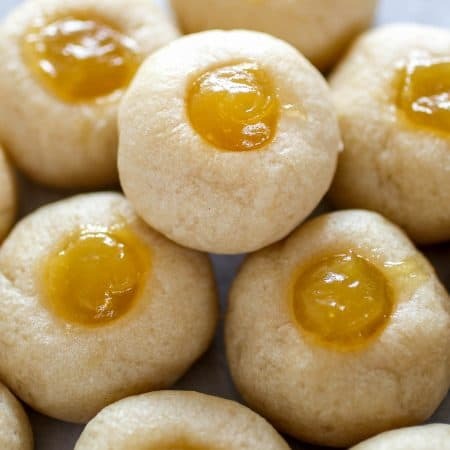 If you wanted to make it gluten free as well, just do 2 1/4 cups white rice flour, add 1 1/2 tsp xanthan gum, and 1/4 tsp more of baking powder. I made this cake today and it was disappointing. I followed the recipe to the letter and I probably will not be making it again. The flavor was bland and I even used Meyer lemons! The texture was doughy and dense, definitely not the lighter type cake I was expecting. I will be searching for another lemon cake recipe. Sorry. That happened to me!!! i dont know why!! i like the lemony flavor it was excellent but the cake was dense and doughy. That means you did not bake it long enough. This is not meant to be a fluffy cake, it is velvety soft and dense almost like a pound cake. Glad it was enjoyed anyway! Just made this! Yummo!!! Thanks for the recipe! I made this cake for my family and swirled on some raspberry preserves at the end to make a lemon raspberry bundt cake. This was such a hit, everyone loved it! Even without the raspberry, I know this would have wowed them. It’s incredibly moist, fluffly, and full of flavor. Mis cordiales saludos, desearía saber cuantos gramos equivale las 10 cucharadas de mantequilla que hace referencia en la receta del Pastel Bundt Super Limón. My daughter and I have made this twice now. Its great, the zest sugar and glaze really add some zing. Like others I’ve had to bake this significantly longer. First one wasn’t done until 50 mins, this one is at 39 and still wet too. Not my oven as we just had it checked, it was within 2 degrees. Great recipe, it doesn’t last two days in our house! Made this today and it’s delicious! Tried out a silicone pan (not sure I’m a fan)and of course I had to adjust for altitude since I Love above 6000′ and it turned out great. Can you use buttermilk in place of the whole milk?? I love lemon desserts! Just made the lemon bundt cake. It’s beautiful! Can’t wait to eat it! I’m going to make this recipe with mini bundt pans for a friends birthday! It’s going to be super cute. I’m also going to put some raspberries on top. This is a great recipe. I’ve made a lot of lemon cakes with different recipes, this is the best one. While it is slightly dense, like a pound cake, it is not heavy. The crumb is very delicate and the lemon flavor is perfect. Warming the milk and butter is brilliant, it makes all the difference with this cake and was so successful I’ll be trying this technique with other cakes. Thank you, an excellent recipe. Yes! That is what i love about this cake, the texture is like velvet. Thanks Sara! Just made this cake yesterday. It was my 1st pound cake. I didnt do the zest only because I dont like zest and I did add milk along with the lemon for the glaze because lemon alone was too “lemony”. But this recipe was very easy which I needed for a beginner. But from the looks of the end result, you would have thought I had been making cakes forever. The cake is absolutely delicious!!!! Great recipe to follow. Yay! Love comments like these. Thank you Gina! Thank you so much for posting and sharing this recipe. I made it for the first time yesterday for Easter. A little risky considering I didn’t pre try the recipe ahead of time. I made two, one for my Grandmothers home and one for my in laws. This bunt was a hit at both!! My only regret is that I didn’t make a third for my own home. I can’t wait to try other recipes you have on your site. Keep doing you!!! I guess you’ll just have to make another!! Ha! Thanks Amanda, I am happy your family enjoyed the cakes on such a special day! I made this for my husband’s birthday yesterday and he LOVED it! He even said this recipe is better than his mom’s lemon cake recipe (that’s high praise)! I followed it as is and it was perfect. I think I will be making this every year now Thank you! Hah! Oh my goodness, that’s so awesome that it still worked out for you! Just baked this for my first bundt cake, and had the same bake time issue that some others have reported. My guess is that it has to do with the color of your pan rather than differences in ovens. I have a light-colored one. Jessica – did you bake this with a dark-colored pan? I probably took it a wee bit too far (kept adding time with each toothpick test – 60 min if I had to guess). But it still tastes moist and delicious! The glaze and lemon sugar are a must. Cheers! I posted a response a few weeks back, but I don’t see it on this page. Anyway I bake cakes only from scratch, and plenty of Bunt Cakes and I just have to say that i baked this for a dinner get together with our neighbors and it was a big hit. I did add a half a block of cream cheese to the glaze because mine came out runny so the cream cheese thickened it a little. Thanks for the great recipe. The addition of cream cheese in the glaze sounds really yummy! My lord this is the BEST lemon cake I have ever had, and probably the moistest cake I’ve ever had. I did double the amount of lemon juice because I had a bag of lemons wanted it really lemony and Oh my, it is delicious!! Yay! Sounds even more delicious with more lemon! This is a great recipe, I have made it a few times. It is a very moist and lemon cake. Thanks for sharing it we love love love it! I have my fingers crossed that this will work in mini bundt cake pans. I will have to let to you know! I’m sure it will! Let me know! Excellent recipe, came out perfect, will be one of my top cakes to make for guests or bring to someone’s home. Cake was absolutely delicious, fluffy and amazing!!!!!!! How long does this recipe take to make in total? I wasn’t sure about the 27-35 minutes because I have never baked a bundt cake in less than 50 minutes to 1 hour, but surprisingly this cake came out perfect after allowing it to bake for 35 minutes and sit for 5 minutes. I didn’t really taste the lemon , but it is a very moist cake. Hi.I have tried your recipe and it came up fine.One question:In most cake recipes the butter and sugar mix first then eggs and dry ingredients. Your is unique ( never seen this way before) with hot milk with melted butter mixing with the eggs and sugar combination.Why? Yuuuuummmmmmyyyyy! I just made this cake exactly per your recipe. Amazing dense texture that’s moist but not gummy. Unfortunately I’ve never used a bundt pan before, and despite applying a thorough coat of cooking spray to the pan, the cake wouldn’t come out. I was going to bring the cake to an event at a friend’s house tomorrow, but it was too funny looking after I pried it out. It’s not pretty enough to share with my friends, but it’s certainly tasty enough for my husband and me! Seriously one of the best cakes I’ve ever made/had. I will definitely make this again, and learn to master the Bundt pan! Made this tonight for the first time. It turned out so dense and thick. I’m not sure where I messed it up. It had great flavor though. I made this cake for my supper group. It made 2–9 inch rounds and an 8 inch round. They are beautiful! I love how the zest and the sugar look sprinkled on the cake. Can’t wait to try them. Lemon is a family favorite and I couldn’t wait to make this wonderful looking cake! The flavor was perfect (I used Myer lemons), however, I was so disappointed when I cut into it! It was so dense! I followed the recipe exactly and don’t know what went wrong! I was wondering if it would be possible to use 2% milk instead of whole milk? Made this Saturday. Very tasty…it really puffed up and then deflated…don’t know why that happened. However, it looked good and tasted good, so I guess there was no harm. Not a baker as such, but have never made a cake where you warm the milk/butter before adding to ingredients. Can you tell me why this is done? Made with orange juice and orange zest. Will make again! Thanks for the recipe. Sounds like it wasn’t fully baked in the middle! 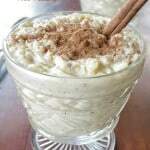 I have made this recipe and it is delicious! My question is why do we heat the milk and butter? Most recipes I found cream the butter with the sugar and use non-heated milk. Thanks for teaching and giving us your tricks! You’re so very welcome, Jennifer! What is your altitude? Mine is almost 6000’. Makes cakes difficult. Well, this will be the first for me melting the butter in the hot milk. I just can’t imagine how this all works out because the cakes texture in the picture looks just like you could have beaten the butter and sugar until light and fluffy. I am not the scientific minded, so this one… I’m going to definitely try this weekend. I really like all the lemon infusion — the ample lemon zest along with the 5 tsp+ of fresh lemon juice. This should pack a very lingering result! This is my favorite lemon cake! I usually skip the lemon sugar topping, but it’s still so good. I’m currently pregnant and been craving it all week. We finally got lemons and it’s in the oven now! I can’t wait! I have made this cake recently and it was a huge hit! My mother-in-law wants me to make it for a special event that has a pink theme, do you have any suggestions on how I can make the glaze pink? Would you just use food coloring? I saw in the comments a recommendation to try it with grapefruit zest in the sugar topping so that’s another option to add pink to it. Also, for another time I want to make this could I include blueberries? Would you suggest putting the blueberries in the batter right before you bake it? My mother-in-law had an outpatient procedure done so I wanted to make her and my father-in-law a few of her favorites for a good dinner. She loves my lasagna so that was an easy decision but dessert was more difficult. She LOVES citrus desserts so I tried this and am SO glad I did! They loved it, and I asked my husband to bring me a slice back after delivering so I could try it, too. ; ) I agree with them! I didn’t have enough lemon rind for the sugar and was short a bit for the cake but it was still very lemony and delicious! Thank you for sharing this. It has been printed and filed!!! Sorry, I tried this recipe but didn’t work. It was almost totally underbaked in the center, and I baked it for an extra 5 minutes. I’m sure I did something wrong; I only have a hand mixer, not a stand one. But seems there’s some extra steps – heating the milk? – whereas other bundt cake recipes are simpler. Should this be stored in the refrigerator? I made this for our weekend girls trip and it was a HUGE HIT!! I did end up having to cook it an extra 12 minutes. I added some rosemary to the batter, because I love rosemary & lemon together! Next time, I’ll add more lemon zest as it wasn’t super lemony, but freakin’ MOIST! The girls LOVED IT!!! Thanks for the keeper!! I made this cake today & it is soooo good!. I poured the batter into 3 ea 6inch mini bundt pans. They are so cute! I had to bake them for 40 minutes. I kept checking my oven every 5 minutes after 25 minutes. When I buy a bag of lemons, I juice the lemons and put them in ice cube trays…then bag them once they are frozen so this way I always have my lemon juice ready. I also jest the lemons & freeze them in little packets of 1 teaspoon each so I have that ready too. I’m keeping one mini bundt cake & sharing the other two w/neighbors. Thanks for the great recipe. I made this cake for a going away party at work. We made a potluck of the guest of honors’s favorite foods. She wanted a lemon cake so I made this. It went over great! Got rave reviews from my coworkers. Now my daughter wants me to make her one for her birthday! That’s wonderful! Glad to hear it. Delicious! I used gluten free flour and let the batter rest in the pan 10 minutes before baking. The lemon sugar makes it! Agreed! The lemon sugar really makes it pop.